In 2006-2007, millions of people participated in protests over a proposed change to U.S. immigration policy. These large scale mobilizations are widely seen as a historic turn point in Latino politics, especially Latino immigrant civic participation and political influence, as noted in a range of scholarly publications in this field. The protests began in response to proposed legislation known as H.R. 4437, which would raise penalties for illegal immigration and classify undocumented immigrants and anyone who helped them enter or remain in the US as felons. As part of the wider immigration debate, most of the protests not only sought a rejection of this bill, but also a comprehensive reform of the country's immigration laws that included a path to citizenship for all undocumented immigrants. The 2006 immigration protests were a series of demonstrations that began in Chicago and continued throughout major cities nationwide for a period of eight weeks. 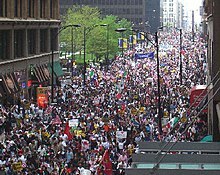 The first major demonstration in Chicago was held on March 10, 2006, and was estimated to have about 100,000 participants. It was the initial impetus for many of the other protests which followed throughout the country. The largest single protest occurred on March 25, 2006 in downtown Los Angeles with an official estimate of more than 500,000 people marching in what organizers called "La Gran Marcha" ("The Great March") . Organizers of La Gran Marcha, however, state that the actual revised number of participants is somewhere between 1.25 and 1.5 million estimated through later photographic analysis. The largest nationwide day of protest occurred on April 10, 2006, in 102 cities across the country, with 350,000–500,000 in Dallas. Most of the protests were peaceful and attracted considerable media attention. Additional protests took place on May Day. The marches reached a climax on May 1, 2006 and were nicknamed "A day without Immigrants." Naming the protests in such way encouraged immigrants to quit their daily labor-intensive jobs for a day to draw attention to their significant contributions to U.S. daily life. Latino immigrants across the country were urged to boycott work, school and other economic activities. Those outside the Latino community were shocked to see the growing workforce of janitors, nannies, restaurant workers and many other service workers leave their underrepresented and under appreciated jobs to join the protests. The mobilization of working-class undocumented immigrants challenged the belief that the United States would be able to prosper without undocumented immigrants. The protests took place on May 1, a date meant to honor workers throughout the country. The May 1st marches reflected the immigrant protesters' identities as workers and significant contributors to U.S. society. Most immigrants of Latin American descent come to the United States seeking economic prosperity for themselves and their families, they infrequently accept low wage jobs to survive in the United States. Therefore, missing work for a day burdened their families. Yet, thousands of immigrants risked their jobs and joined the marches to demand political recognition. To understand the 2006 immigrant protests and the discourse behind unauthorized immigration as a leading topic in U.S. political debate, it is necessary to understand the history of unauthorized immigration. Since the 19th century, mass unauthorized immigration from Latin America to the United States has greatly impacted Latino politics. Unauthorized immigrants are individuals who arrive and live in the United States without legal documentation. In many cases, individuals arrive to the United States with legal documentation such as tourist or student visas and overstay the amount of time they are allowed to remain in the United States, thus becoming unauthorized immigrants. Many others cross the borders between the United States and Mexico, or the United States and Canada, without legal documentation. Today, undocumented entry to the United States is a misdemeanor. Unauthorized immigration did not always exist to the extent that it does today. Before 1965, the United States did not have numerical restrictions on immigration from countries in the western hemisphere. In 1965, the United States passed the Immigration Nationality Act and repealed the 1924 National Origins Act designed to limit migration from southern and eastern European countries, thus making it possible for eastern-hemisphere countries to have equal access to visas in addition and consequently restricting migration from the western hemisphere for the first time. Furthermore, the 1965 Act provided unlimited number of visas for family reunification because it allowed naturalized U.S. citizens and permanent residents to request permission to bring their family members to the United States. The 1965 Act influenced Latinos/as citizens and permanent residents to request visas that allowed their family members to immigrate to the United States. This resulted in a shift of the country's ethno racial makeup and the creation of a large Latino population in the United States. The 1965 Act's restriction on the number of visas allotted to western hemisphere countries created the phenomenon of large scale unauthorized western hemisphere migration, particularly from Latin American countries like Mexico. In the 1980s, the United States government began to express concern about the large scale flow of unauthorized immigration, which led to the Immigration Reform and Control Act (IRCA) of 1986. First, the Act made it illegal for employers to hire workers who could not provide proof of legal immigration to the United States. Second, it allowed for the legalization of immigrants who could prove residency in the U.S. since January 1, 1982 and agricultural workers who began working in the United States prior to May 1986. Out of the 3 million migrants that applied for IRCA, 2.7 million, many of whom were Mexican, were given a path to citizenship. However, in the long term, IRCA was not successful in reducing the flow of unauthorized immigration to the United States. As a result, the U.S. government began to increase the funding of Border Patrol as a means to regulate the flow of undocumented immigrants to the United States. These actions proved to have little impact on unauthorized immigration, resulting in about eleven million unauthorized immigrants living in the United States, the majority being of Mexican origin. Therefore, discourse about the flow of unauthorized immigration has been known as a "Mexican" or "Latino" problem. The large scale flow of unauthorized migrants and the significant ethno-racial shift that occurred as a result of 1965 Act, have resulted in anti-immigrant backlash that targets Latino immigrants. Spanish-language media outlets, in particular Univision, Telemundo, Azteca América and La Opinión (Los Angeles' largest Spanish newspaper), advertised the protests on their front page. They called it a "Mega Marcha", a mega march, as a way to emphasize the large scale of the marches. This strategy allowed for the spread of mobilizations throughout the country. KMEX- TV in Los Angeles, an Univision owned and operated television station, called the protests "Pisando Firme", stepping strong, to remind protesters to march "with pride, with dignity, with order, for your children, for your people, for your community." Although television and newspapers effectively mobilized protesters, it was radio stations which truly promoted the protests. Various Spanish-language radio stations across the country, in large part aided in mobilizing people for the protests. Eddie "Piolín" Sotelo, a Spanish-language radio personality from Los Angeles, persuaded eleven of his counterparts from Spanish-language radio stations based in Los Angeles to also rally listeners to attend planned protests. Piolin Por La Mañana, is known to be one of the most popular radio shows in the country. The Piolín's radio show, recorded near Los Angeles, is broadcast in 47 markets across the country including Chicago, Dallas, Houston, Miami, Phoenix, San Francisco and New York, many of the cities where the protests took place. In addition to mobilizing thousands of immigrant protestors, Eddie "Piolin" Sotelo made multiple appearances during protests, which increased his moral authority towards his Latino audience. Religious leader Cardinal Roger M. Mahony, from the Archdiocese of Los Angeles, showed his support of immigrant protesters and urged Catholics, many of whom are Latino, to support the protests. He urged the Catholic community to spend Lent fasting and praying for an immigration reform that would counteract HR-4437 and the criminalization of immigrants. Cardinal Mahony made an official statement against HR-4437 through which he instructed Catholic priests to defy any law that required them to ask immigrants for legal documents. He stated that immigration was not about politics, rather the way in which human beings treat one another, while asserting that all Americans are of immigrant ancestry and share universal citizenship. It was not media alone that mobilized protesters, rather the media in partnership with migrant organizations and leaders. When analyzing the immigrant civic participation in the 2006 protests simply acknowledging the media's influence is not enough. It absolutely necessary to understand the "meta-network" of activists and leaders that used media as a call to action. The initial protests caused much controversy after some protesters waved Mexican and Central American flags instead of American flags. Various talk-radio hosts and columnists played up the contentious nature of displaying non-U.S. flags during the protests. One particular incident referred to involved a protest at Montebello High School in California, where a Mexican flag was raised on a flagpole over a United States flag flying in the distressed (or upside-down) position. Because of the controversy, organizers of the protests encouraged protesters to leave their Mexican flags at home, with Cardinal Roger Mahony telling Los Angeles protesters to not fly any flag other than the United States flag because, "...they do not help us get the legislation we need." As a result of this controversy later protests featured fewer Mexican flags and more protesters carrying American flags. The Washington Post reported that, in the Washington, D.C. suburb of Herndon, a day labor center at which suspected undocumented immigrants gathered was closed and its mayor and two aldermen lost reelection, in part due to immigration concerns. Membership in the Minuteman Project increased due in part to backlash from the protests. On May 3, responding to the May 1 boycotts, the Minutemen embarked on a caravan across the United States in an effort to bring attention to a perceived need for border enforcement. The caravan was expected to reach Washington, D.C. on May 12. Regarding the Tucson-based anti-immigration movement: In 2006, the Southern Poverty Law Center wrote: "Roy Warden, 59, emerged this spring as one of the country's most controversial, volatile, and, many believe, dangerous characters of the anti-immigration movement." Although HR-4437 failed to pass through the Senate, it left a trail of consequences that affected the immigrant community. One of those consequences was intensive Immigration Customs Enforcement (ICE) raids during the final years of the Bush administration which continued throughout the Obama presidency. The increase in Immigration Customs Enforcement raids was meant to suppress further immigrant organizing. In the next couple of years, more than 300,000 undocumented immigrant were deported to their home countries, that is 100,000 more than the number of deported immigrants in 2005, a year before the protests. The increase in deportations caused fear of retaliation within the undocumented community and resulted in rapid demobilization. Although HR-4437 did not become a law at the federal level, it did not prevent individual states from passing similar laws. In 2006, Pennsylvania passed the Illegal Immigration Relief Act, which fined landlords who rented housing to undocumented immigrants and also fined business owners who hired them. The State of Arizona passed S.B. 1070, which led to racial profiling and required police officers to request legal documentation from anyone they suspected was undocumented. Both laws, along with similar others, were deemed unconstitutional in part because the U.S. Constitution assigns control over immigration to the federal government, not individual states. Since undocumented immigrant communities were unable to vote, lobby, or influence politicians in more traditional ways, Latino leaders mobilized immigrants through non-voting activities, such as protests. Many Latinos indicated that the marches were the beginning of a new social and political movement that sought to gain civic empowerment. A report released by the Pew Hispanic Center indicated that Latinos would most likely vote in subsequent elections and The National Immigration Forum found that Latino voters were more enthusiastic to vote in 2006 due to the immigration debate, and the need to prevent legislation like HR-4437 from being approved by Congress. "Today we march, tomorrow we vote," was one of the most popular slogans during the 2006 immigrant protests. Such slogan indicated the value and need for Latino/a political contribution and recognition. March 27: Hundreds of high school students walk out of class in protest in Northern Virginia . March 29: 8,000–9,000 marched from The Coliseum to Legislative Plaza in Nashville. March 30: Robert Pambello, the principal of Reagan High School in Houston, placed a Mexican flag below the American and Texan flags and was ordered to remove it. He later resigned from his position for apparently unrelated reasons. In South West Houston, high school students from Robert E. Lee High, Bellaire High, Sam Houston High School (joining from Houston's Northside) and other middle schoolers joined together in a march that was taken to city hall. March 31: 3,000 high school and middle school students in Las Vegas walk out of class to protest. Some college and community college students join them on their protest. Students Of Jersey City's McNair Academic High School gather to protest the proposed H.R. 4437 at Liberty State Park after walking out of their school at 2:00 pm on April 10, 2006. Las Vegas, a well-organized march of approximately 3,000 people was held. Protesters marched two miles from Jaycee Park to the Federal Courthouse during the first day of the Clark Country Spring Break, waving Mexican and American flags alike. They protested in favor of amnesty. Seattle, between 15,000 and 25,000 marched to a rally at the federal building where speakers in support of the demonstrators, such as Mayor Greg Nickels and County Executive Ron Sims spoke. Just five thousand were expected. In Las Vegas, a rally with an estimated minimum of 300+ was held at the Cashman Center; several important opposition figures showed up, such as Jim Gilchrist, the Nevada Secretary of State, local radio host Mark Edwards, and numerous state Minuteman Project branches to protest against amnesty. In Reno, Nevada, between 2,000 and 4,000 protesters marched through the downtown area, from the University of Nevada, Reno campus to the Bruce R. Thompson Federal Building, and continued to a designated spot near the Meadowood Mall. Traffic was held and diverted along South Virginia Street during the march. April 28: Nuestro Himno, a Spanish language rendition of the Star Spangled Banner, is played simultaneously on about 500 Spanish language radio stations across the country. The controversy died in a few days, after it was revealed that Cuban immigrant Jon Secada had sung the anthem in Spanish at Bush inauguration ceremony , and that a Spanish version of the anthem had been commissioned by the Bureau of Education of the United States in 1919 . An estimated 400,000 marched in Chicago, according to police, though organizers pegged the total at closer to 700,000; "Latinos were joined by immigrants of Polish, Irish, Asian and African descent." A riot in Vista, California was disbursed by 200 police officers. According to LA Observed, an altercation occurred between protestors and police at MacArthur Park in Los Angeles. May 25: The United States Senate passes S. 2611 which includes a path to citizenship for up to 8.5 million undocumented immigrants. The bill eventually failed and was never enacted. H.R. 4437 (The Border Protection, Anti terrorism, and Illegal Immigration Control Act of 2005) was passed by the United States House of Representatives on December 16, 2005 by a vote of 239 to 182. It is also known as the "Sensenbrenner Bill", for its sponsor in the House of Representatives, Jim Sensenbrenner. H.R. 4437 was seen by many as the catalyst for the 2006 U.S. immigration reform protests. The Immigration Reform and Control Act of 1986 previously gave "amnesty" to 2.7 million undocumented immigrants. Proponents of the measure, including then-President Reagan, said the measure, paired with stricter employer rules and a better path for legal entry, would reduce illegal immigration. The companion bill passed by the United States Senate was S. 2611, which never passed conference committee. The House Republican leadership stated that it rejected S. 2611 wholly and would only pass legislation that addressed border security. The end of the 109th Congress marked the death of this bill. The USA Supreme Court on June 16, 2008, ruled in Dada v. Mukasey, per ponente Justice Kennedy ruled (5–4) "that someone who is here illegally may withdraw his voluntarily agreement to depart and continue to try to get approval to remain in the United States." The Court held that complying with a deportation order did not strip an immigrant of the right to appeal that deportation order. The lawsuit is about 2 seemingly contradictory provisions of immigration law. One prevents deportation by voluntary departure from the country. The other section allows immigrants who are here illegally but whose circumstances have changed to build their case to immigration officials, and who must remain in the US. In the case, Samson Dada, a Nigerian citizen, overstayed beyond the expiration of his tourist visa in 1998. Immigration authorities ordered him to leave the country as he agreed to leave voluntarily, but to allow his legal re-entry, unlike if he had been deported. May 1, 2006 'A Day Without Immigrant' National Mobilization Endorsers' – national coalition of 215 organizations that mobilized one million protesters across the U.S. on May 1, 2006 for the Great American Boycott. El Paro and the Day Without and Immigrant Coalition (Philadelphia Region) Philadelphia regional coalition of dozens of organizations invited and mobilized thousands of protesters in 7 marches from February 14 to April 10, 2006. Kentucky Coalition for Immigrant and Refugee Rights – Kentucky coalition that mobilized an estimated 10,000 people in downtown Lexington, Kentucky on April 10, 2006 with other mobilizations around the state. Typically anti-illegal immigration movements focus on grassroots recruiting tactics; the Minutemen Civil Defense Corps and Minuteman Project use these methods to boost membership. After the 2006 immigration reform protest, anti-immigration movement participation increased by 600%. Anti-illegal immigration groups often do not pursue the same agenda in the same ways; however, they do form coalitions when their agendas match other movements. One of the major joint efforts that these groups engage in is access to mailing lists for individuals who have donated money in the past to support the movement; Federation for American Immigration Reform and Minutemen Civil Defense Corps have shared lists of mailers with one another in recent years. ^ Updated 64 minutes ago (March 25, 2006). "500,000 rally immigration rights in L.A. – Politics". MSNBC. Retrieved September 22, 2010. ^ "CNN.com – Protests precede Senate immigration battle – Mar 28, 2006". CNN. Retrieved April 22, 2010. ^ Dawn Garcia, "Spanish-Language and Digital Media: A New Counterpublic Sphere In California." Tangents: The Journal of the Master of Liberal Arts Program at Stanford University Volume 8 (2009): 9. ^ a b Laura Pulido, "A Day Without Immigrants: The Racial and Class Politics of Immigrant Exclusion." Antipode 39, no. 1 (2007): 7. ^ Garcia Bedolla, Lisa (2014). Latino Politics. Malden, Massachusetts: Polity Press. p. 236. ISBN 9780745664996. ^ a b c Garcia Bedolla, Lisa (2014). Latino Politics. Malden, Massachusetts: Polity Press. p. 237. ISBN 9780745664996. ^ Garcia Bedolla, Lisa (2014). Latino Politics. Malden, Massachusetts: Polity Press. p. 238. ISBN 9780745664996. ^ Garcia Bedolla, Lisa (2014). Latino Politics. Malden, Massachusetts: Polity Press. p. 239. ISBN 9780745664996. ^ Flaccus, Gillian (March 29, 2006). "Spanish-language media credited on pro-immigrant rallies". The Boston Globe. ^ Dawn Garcia, "Spanish-Language and Digital Media: A New Counterpublic Sphere In California." Tangents: The Journal of the Master of Liberal Arts Program at Stanford University Volume 8 (2009): 10. ^ Leo R. Chavez, "The Immigrant Marches of 2006 and The Struggle for Inclusion", in The Latino Threat: Constructing Immigrants, Citizens, and The Nation. Second ed. (Stanford, California: Stanford University Press, 2013). 159. ^ David Ayon, "Migrant Organization and Mexican Policy" (Conference Speech, A Lehman-Cuny Sponsored Invitational Conference, Manhattan, October 20, 2006). 46. ^ a b "The foreign flag rule"[permanent dead link] by Clarence Page, The Baltimore Sun, April 14, 2006. Retrieved April 14, 2006. ^ Student punished for American flag incident by Tracy Garcia, Whittier Daily News, April 1, 2006, and "The American Flag Comes Second" Archived May 17, 2006, at the Wayback Machine by Michelle Malkin, posted March 29, 2006 01:15 AM. Both accessed April 14, 2006. ^ "Mexico says U.S. group burning Mexican flag is unacceptable" Archived September 2, 2006, at the Wayback Machine KVOA TV, Tucson, Arizona, April 11, 2006. Retrieved April 14, 2006. ^ "Protesters work to change image" Archived April 12, 2006, at the Wayback Machine by Peter Prengaman, Associated Press, Long Beach Press-Telegram, April 11, 2006. Retrieved April 14, 2006. ^ Krauthammer, Charles (April 14, 2006). "Immigrants Must Choose". The Washington Post. Retrieved April 14, 2006. ^ Turque, Bill; Stewart, Nikita (May 3, 2006). "Labor Site Backlash Felt at Polls In Herndon". The Washington Post. Retrieved April 22, 2010. ^ Reid, T. R. (May 3, 2006). "Hill Impasse Spurs States to Tackle Illegal Immigration". The Washington Post. Retrieved April 22, 2010. ^ "Deadly Force | Southern Poverty Law Center". Splcenter.org. Retrieved September 22, 2010. ^ a b Kim Voss and Irene Bloemraad, Rallying For Immigrant Rights: The Fight For Inclusion In 21st Century America (Berkeley, California: University of California Press, 2011). 35. ^ Kim Voss and Irene Bloemraad, Rallying For Immigrant Rights: The Fight For Inclusion In 21st Century America (Berkeley, California: University of California Press, 2011). x. ^ Kim Voss, "Rallying for Immigrant Rights: The Fight for Inclusion in 21st Century America ". (2011): 6. ^ Juan Andrade, "Immigration and Its Impact on Latino Politics", in The Almanac of Latino Politics 2008. 5th ed. (Chicago: United States Hispanic Leadership Institute, 2008), 57. ^ Xochitl Bada, Jonathan Fox, and Andrew Selee, eds. Invisible No More: Mexican Migrant Civic Participation in the United States. Washington, D.C.: Mexico Institute, 2006. v.
^ "Stirring the Other L.A.: How the media and immigrant advocates got 500,000 people to protest". Los Angeles Weekly. March 30, 2006. Archived from the original on April 29, 2010. ^ "La Gran Marcha Highlights Difference Between Protests of 2006 & Today". Mexican American News. March 22, 2016. ^ "Columbus Rally for Immigrants' Rights, 2006-03-26". Taterenner.com. Retrieved September 22, 2010. ^ "Students Walk Out in 2nd Day Of Immigration Rights Protest". WashingtonPost.com. Retrieved September 22, 2010. ^ "Latinos rally for rights". Shelbyville Times-Gazette. March 30, 2006. Retrieved May 25, 2018. ^ "Reagan HS principal resigns – Houstonist: Houston News, Food, Arts & Events". Archived from the original on August 11, 2009. Retrieved August 7, 2009. ^ "Immigration Law Protests March On". CBS. March 31, 2006. ^ Confessore, Nicholas (April 2, 2006). "Thousands Rally in New York in Support of Immigrants' Rights". The New York Times. ISSN 0362-4331. Retrieved May 25, 2018. ^ "CNN.com – Lawmakers: Immigration bill not dead – Apr 9, 2006". CNN. Retrieved April 22, 2010. ^ Swarns, Rachel L. (April 11, 2006). "Immigrants Rally in Scores of Cities for Legal Status". The New York Times. Retrieved April 22, 2010. ^ Staff writer, "Oakland Adds Voice to Growing National Debate" Archived March 16, 2012, at the Wayback Machine, Oakland Tribune, April 11, 2006. ^ Derek Sciba (April 13, 2006). "Woodburn students march over immigration". KATU. Archived from the original on May 18, 2006. ^ "Minutemen volunteers build fence to protest illegal immigration". The San Francisco Chronicle. Archived from the original on April 4, 2009. ^ Archibold, Randal (May 2, 2006). "Immigrants Take to U.S. Streets in Show of Strength". The New York Times. p. A1. ^ Gorman, Anna; Miller, Marjorie; Landsberg, Mitchell (May 2, 2006). "Marchers fill L.A.'s streets". Los Angeles Times. p. A1. Retrieved February 3, 2011. ^ Delson, Jennifer; Reyes, David (May 2, 2006). "Santa Ana Rally Draws at Least 10,000; Many Businesses Close". Los Angeles Times. p. B1 (Orange County edition). ^ Repard, Pauline; Davis, Kristina (May 2, 2006). "200 officers clear streets in Vista after reported riot" Archived April 4, 2009, at the Wayback Machine. The San Diego Union-Tribune. ^ Roderick, Kevin (May 1, 2006). "Police fighting with protesters at MacArthur Park" Archived March 4, 2016, at the Wayback Machine. LA Observed. ^ Norman, Jane; de Jesus, Jose (April 1, 2006). "Iowa's future linked to fate of immigration"[not in citation given]. The Des Moines Register. ^ Vu, Thuy. "Protests May Stir Anti Immigration Backlash". San Francisco: KPIX-TV. Archived from the original on September 27, 2007. ^ Lowe, Peggy. "New voice joins minuteman caravan". Orange County Register. ^ Longley, Robert. "Immigration Reform: Protest and Support". US Government Info. ^ "Immigration Bill Protests Crop Up Across U.S." NPR.org. Retrieved May 25, 2018.